A group of concerned residents (disclaimer: including this reporter) have started a campaign to have an eastern cycling bypass of the Elephant and Castle roundabout system included in the planned regeneration scheme, which is currently out for consultation. Residents and cyclists want the new development to include a direct, fast and safe cycling route, as an alternative to the roundabout – confirmed by City Hall as London's most dangerous junction for cyclists. 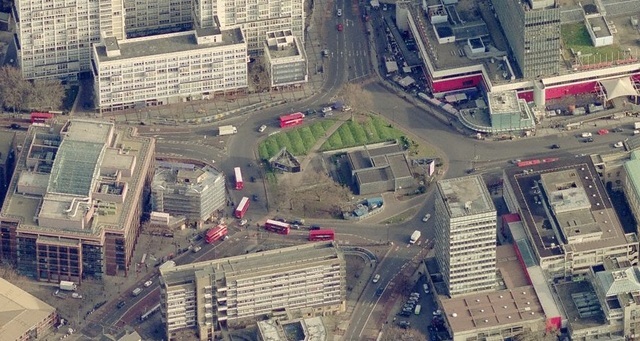 Earlier schemes to replace the roundabout with a safer 'peninsular' junction have been abandoned by TfL who are concerned the proposal will increase congestion, making the need to provide a suitable alternative paramount. A western signed bypass already exists, and was recently adopted as part of CS7, but the slow route, involving many twists and turns, deters people from using it. The redevelopment of the eastern side of the junction creates an opportunity to do it right. The current regeneration scheme, led by Olympic Park developer Lend Lease and now under consultation, doesn't include a cycle bypass – a 17 storey building is proposed that will block the shortest route from ever being used. The group is asking people who traverse the Elephant by bike to get in touch with the consultation and ask for the direct bypass to be included in the planning application. A presentation putting the case for the eastern bypass, and detailing how you can help, can be found here.